There’s something exciting in the air, and by air, I mean your mouth. That’s because the days of “classic” cannabis edibles — those fat-filled, calorie-laden chocolate pot brownies and cookies — are officially gone. Sure, you can still find the traditional marijuana desert edibles, but they’re quickly being replaced by more exciting, exotic, even healthy cannabis treats. This post won’t cover the new-age healthy options (you can check out our post on vegan marijuana edibles for that), but rather how “desert-edibles” are getting a makeover. Edipure candy products usually come in small 10mg pieces, so it’s easy to control your dosing. 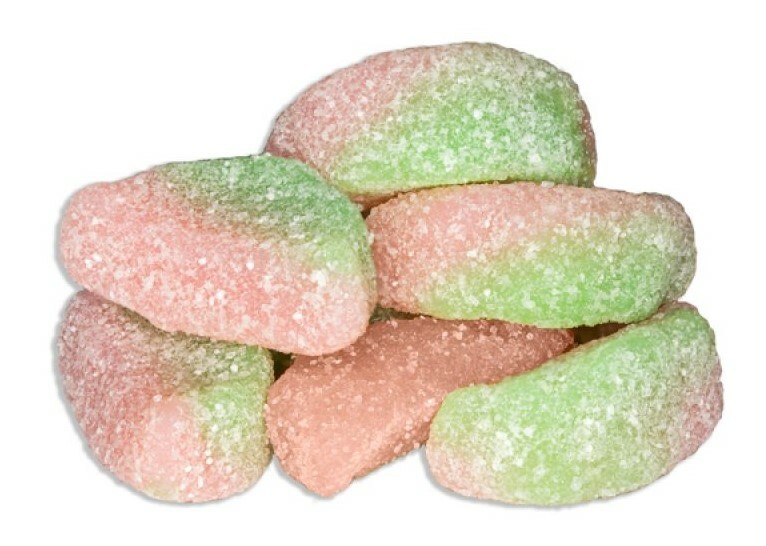 If you’re going to give these little guys a shot, we recommend the “Watermelon Tart” flavor! Just make sure you place these goodies out of reach of children, since they directly resemble sugary sweets like Sour Patch Kids. If you want to find EdiPure products near you, you can use their product locator, or you can just search for “Edipure” in the search bar of the Nugg app! Remember the powdered candy craze from the 90’s? Well it’s back with a vengeance in medicated marijuana form. 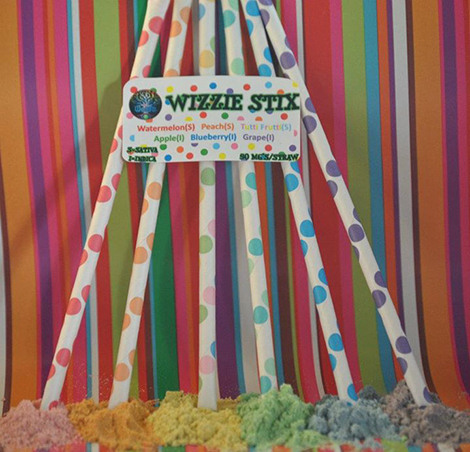 Wizzie Stix are basically Pixy Sticks, but each stick contains 50mg of THC! That’s potent enough for even the stoniest of stoners to feel, so be extremely careful if you’re a new cannabis user. In fact, we recommend starting with just 1/4 of one straw, then working your way up to a full straw if you feel comfortable. In my personal opinion, these straight-sugar edible straws represent one of the most convenient and fun ways to consume cannabis — just pour some sugar down your throat, get medicated and simultaneously enjoy a rush of nostalgia from your days as a young lad! 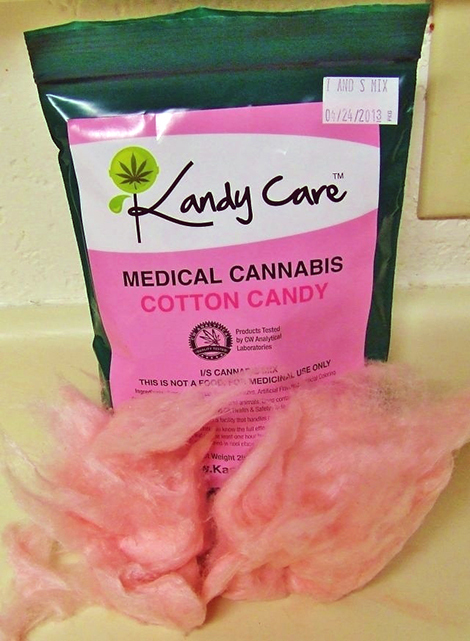 Kandy Care’s medicated cotton candy doesn’t need much explanation. It’s another straight-sugar product, delightfully infused with THC and lab-tested for quality and potency. The only downside to this product is its geo-location lock, which seals the packaging shut until it recognizes you’re either at a monster-truck rally, a baseball game, or the county fairgrounds — the only three places one would ever eat cotton candy. Many cannabis-users dismiss cannabis candy products due to their traditionally low potency (many come in 10mg increments). Well, now there’s a cannabis candy for those with a higher tolerance. 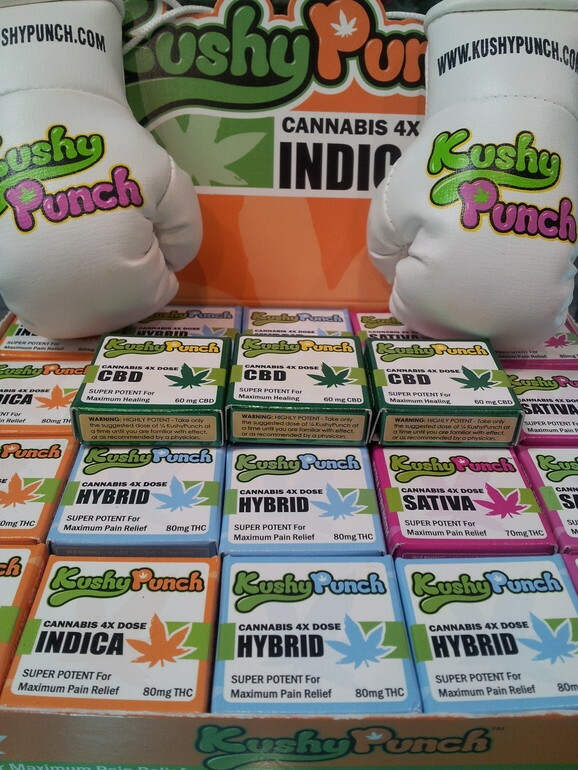 Whether you prefer sativa, indica, hybrid, or even pure CBD; Kushy Punch has a bite-sized product to provide maximum relief. The company hasn’t been around for long (and they produce everything in California) but I’ve seen their products flying off dispensary shelves. And it might not just be their tasty products… the company also donates 10% of their profits to local charities! That’s something we haven’t seen many cannabis brands do, but is something we whole-heartedly endorse. Go Kushy! Do you have a plethora of food allergies? Never fear! Cheeba Chews are here! 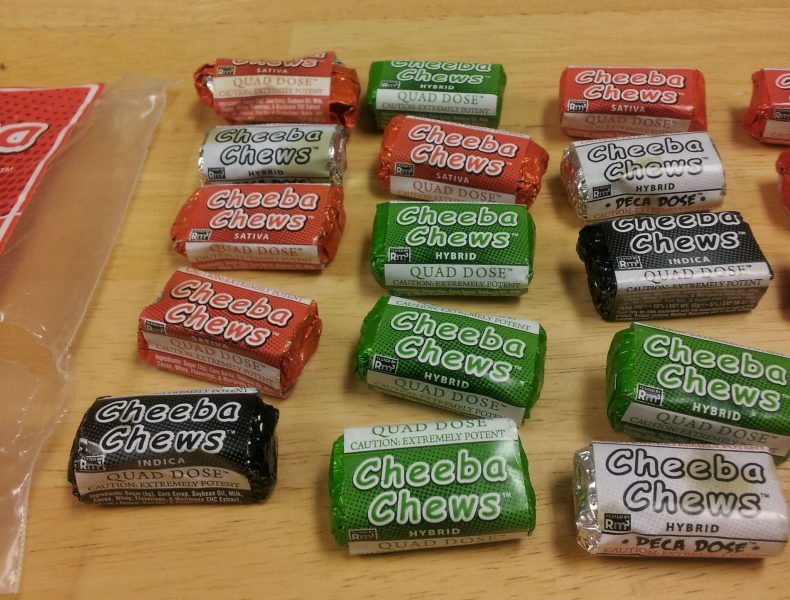 Cheeba Chew products are both gluten and peanut free and the best thing about them is that there are so many different types. There’s a huge selection of doses, strains, and flavors available. They even have some containing only CBD for those of you trying to stay clear headed while still treating your symptoms. Also, you don’t have to look too hard for these. Cheeba Chews tend to be everywhere. In fact, chances are you’ve already heard of this Cannabis Cup winner, these guys are veterans in the world of all things cannabis! They also tend to be on the cheaper side, so if you’re trying to save some dough, this might be the best choice. Plus, check out the artsy video below to see how they’re made! Are you sick of commonplace, tart & sour cannabis candy? Or maybe you’re a cannabis candy connoisseur? 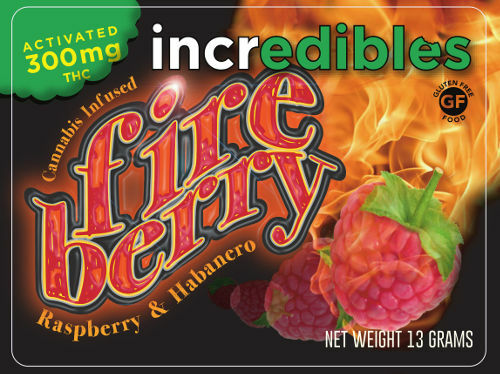 Incredibles has created a name for themselves in the vast world of cannabis candy by inventing a variety of exotic flavors. Most cannabis candies are usually just medicated versions of everyday candy, but Incredibles has created something truly unique. By combining contrasting flavors like raspberry and habanero, the company has set out to create unimaginable taste sensations, fueled by a cannabis-infused high. You could consider this product the fine wine of cannabis candy, so try a bite! Well there you have it folks, six sweet marijuana edibles that will do your sweet tooth some good.